Americans are taught to believe that upward mobility is possible for anyone who is willing to work hard, regardless of their social status, yet it is often those from affluent backgrounds who land the best jobs. Pedigree takes readers behind the closed doors of top-tier investment banks, consulting firms, and law firms to reveal the truth about who really gets hired for the nation’s highest-paying entry-level jobs, who doesn’t, and why. Drawing on scores of in-depth interviews as well as firsthand observation of hiring practices at some of America’s most prestigious firms, Lauren Rivera shows how, at every step of the hiring process, the ways that employers define and evaluate merit are strongly skewed to favor job applicants from economically privileged backgrounds. She reveals how decision makers draw from ideas about talent—what it is, what best signals it, and who does (and does not) have it—that are deeply rooted in social class. Displaying the “right stuff” that elite employers are looking for entails considerable amounts of economic, social, and cultural resources on the part of the applicants and their parents. 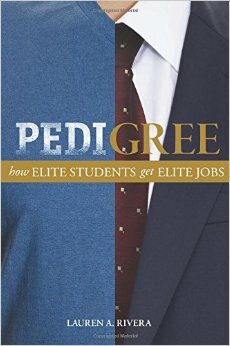 Challenging our most cherished beliefs about college as a great equalizer and the job market as a level playing field, Pedigree exposes the class biases built into American notions about the best and the brightest, and shows how social status plays a significant role in determining who reaches the top of the economic ladder. This entry was posted in Books and tagged lauren rivera, one percent. Bookmark the permalink. I am assisting my granddaughter, LaRae, in getting her message out to all of the people that I know. The portion of her tuition that her mom is responsible for has increased by 50% for the upcoming school year. In spite of LaRae’s stellar high school grades and accomplishments, she was not awarded any major scholarships. Her first two years at Tuskegee have been funded by a combination of loans, grants and out-of-pocket funds. Without significant support, my granddaughter will be unable to return to school in August. Any amount of support will be of great help.